This is a procedure to examine and to operate on the larynx (voice-box) with a microscope. It requires a general anaesthetic and is done as a day surgery procedure. 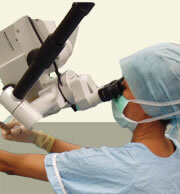 The microscope allows a magnified view of the larynx enabling the necessary surgery to take place. The main one is hoarseness or voice change. Other symptoms include a feeling of something being stuck in the throat or a sensation of discomfort on swallowing. The larynx is examined in the office with a fibreoptic nasendoscope and a diagnosis is made. Depending on the pathology found, surgery may be indicated to remove a laryngeal lesion for further diagnosis. A general anaesthetic is required. Metal laryngoscopes are used to examine the larynx with the use of the operating microscope. The larynx and surrounding structures are examined in detail and any lesion(s) removed. The procedure, risks and benefits will be discussed in full during your consultation with Dr Para.